Errol: Some people may wonder at me keeping the comic close to being true when I add fictional characters in. Well, the thing is, this sorta thing happens all the time. So… the spirit is true. That’s the point. Men go gaga over this girl. Do I get females oggling me?? No. That’s probably for the better. Why weren’t you guys at the Agricola tourney last night? Carel! I don’t know why your comment didn’t go through before, since you were preapproved, sorry. No worries about the comments, I blame it on my Iphone! Oh! Are you doing Nanowrimo too?! 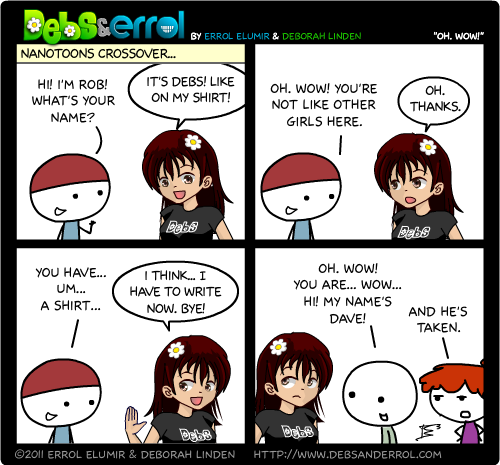 Guess what I meant to say was; if you’re busy, that hopefully means your working on plenty of Nanotoons cross over web comics to keep me entertained. Hmm, I can’t respond to Debs complaining that I give her more work. to clarify, the thing with the sums happens every time. It keeps our minds sharp.